Copyright, Truthout.org. Reprinted with permission. Originally published on TruthOut.org. Often, the structural problems that keep Democrats from embracing Medicare for All are hidden beneath the political surface. This week, however, Democratic candidate for governor in Michigan Gretchen Whitmer and Blue Cross Blue Shield of Michigan offered no such subtlety. Their very public collaboration is a case study in how industry money influences campaigns and elections. Whitmer does not support single-payer health care. She is, however, being challenged by two candidates who do: Abdul El-Sayed, and Shri Thanedar. This appears to have Blue Cross (the state's largest insurer) nervous enough to request that its 8,100 employees support Whitmer for Governor. In a letter signed by Blue Cross executives but paid for by the Whitmer campaign, Blue Cross employees were invited to a fundraiser on March 7 and were given suggested donation amounts based on job title. Significantly, the candidate's father, Richard Whitmer, was president of Blue Cross of Michigan for 18 years and even has a building named after him on Blue Cross's campus. The following remarks were delivered at the 2018 YDSA Winter Conference. I want to open with a brief explanation of what Medicare for All actually is. Medicare for All is simple –– it means socializing health insurance –– making the Federal Government the insurer of all residents. It means the establishment of a single, public, universal health insurance system where everyone, regardless of their employment or immigration status will have insurance. It means comprehensive care: all services provided by a medical professional will be covered. It means free, on-demand, unlimited care at the point of service paid for not on the backs of the sick but through taxes on the rich. That means no fees, no co-pays and no deductibles. And it means the establishment of a jobs program to provide jobs for those who currently work in the health insurance industry and would lose their jobs if the private health insurance system were abolished. And while all of this is attractive to workers, it’s worrisome for our political and economic elite. I will admit I was quick to scoff at what I consider toothless mushmouthed nothingspeak. After all, what’s the point of a health care initiative that claims to recognize the massive inequality in American health but is unable to demand even “universal coverage,” a figurative watermelon on a tee-ball-tee among American policy goals, as a desired outcome? DSA member Benjamin Fong wrote for Huffington Post about the corporate powerhouses Amazon, JPMorgan Chase, and Berkshire Hathaway exploring a “disruptive” health care strategy for its own US-based employees, which would provide (ostensibly low-quality) care at a low cost, supposedly free of profit motives. Fong isn’t having it. And indeed, in spite of the seemingly progressive rhetoric (“improving employee satisfaction,” “free from profit-making incentives,” etc. ), every commentator on this proposal saw it quite clearly as a business decision. The New York Times even compared it to “classic disruption,” where a company enters “a market with a product that is lower in value than that of market incumbents, but much lower in cost.” That a proposed nonprofit health care company would be immediately and so easily compared to “classic disrupters, like Southwest Airlines, MP3s or Japanese carmakers,” is a good indication that most people doubt that health is really the goal here. 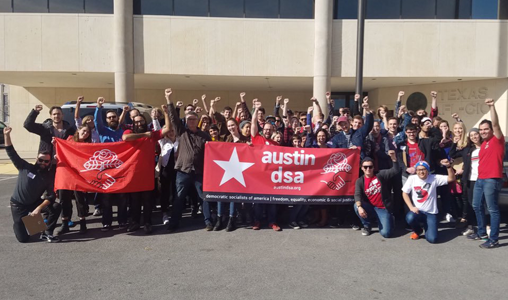 Austin DSA recently participated in a successful local campaign for a local paid sick day ordinance, which we conceived of as part of our work for Medicare for All. On February 15th, 2018, Austin became the first city in the South to mandate that employers provide their employees with paid sick leave, with the ordinance passing 9-2 at City Council. Austin DSA believes this is a huge win, and can be a model for other chapters having difficulty getting their Medicare for All campaigns off the ground. We think this is especially true for other southern chapters, where state legislatures are hostile to any business regulations passed on a municipal level.